The traditional assumption today about race is that it is not political; that it has no political content and is a matter of individual beliefs and attitudes. 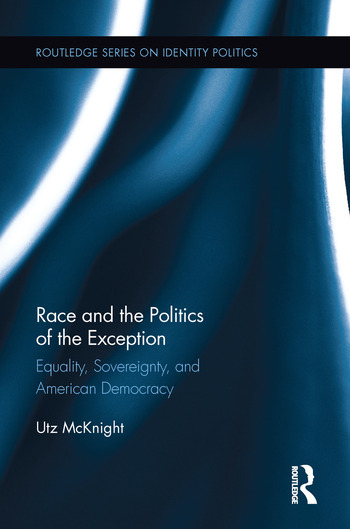 In Race and the Politics of the Exception, Utz McKnight argues that race is in fact political and defines how it functions as a politics in the United States. McKnight organizes his book into three sections, beginning with a theoretical section about racial politics in the United States. Using theorists such as Benjamin, Agamben, and Schmitt, McKnight discusses how the idea of racial communities went from being constituted through the idea of racial sovereignty and a politics of the exception that defined blacks as the internal enemy, to being constitutionally defined through the institutions of racial equal opportunity. In the second section, McKnight further develops his critical race theory by exploring in more detail the social use of race today. The election of President Obama has brought the politics of racial equality to a critical point. In spite of a very powerful set of political tools to define it as a thing of the past, race matters. In the final section, McKnight engages with important African American fiction from each of the three major periods of racial politics in the US. Earlier descriptions of political theory are used throughout these analyses to refine the argument for a new critical politics of race. Scholars of political theory, identity politics, African American studies, and American Studies will find this work ground-breaking and relevant. Utz McKnight is an Associate Professor in Political Science and Chair of the Department of Gender and Race Studies at the University of Alabama. His publications include The Everyday Practice of Race in America and Political Liberalism and the Politics of Race. "If the election of Barack Obama signaled that Americans had embraced the idea of racial equality, it disguised the continuing hold of white sovereignty and subjection of black communities. Utz McKnight demonstrates the danger of accepting the common sense of the ‘post-racial era’ and offers a compelling alternative. Creatively interweaving continental political thought, critical theories of race, and African American fiction, Race and the Politics of the Exception paints a portrait of racial power, from slavery to the present, that demands our attention." "McKnight is one of the most interesting and important writers on the question of race in democratic political theory. In this new book he turns to the actual status of race in the American political system. Importantly, he finds central resources in European thought, which he uses to show that even with the election of an African-American president, race cannot be understood as a matter increasingly of the past. For McKnight. the racial subject remains as a central concern in democratic theory. In A Preface to Democratic Theory, Robert Dahl argued that the path to overcoming racism lay in the attainment of formal juridical equality – McKnight shows us why that is not the case. This book is a new and important reconceptualization of the question of race in America."